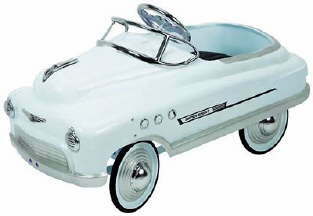 Powder Blue Comet Pedal Car features a black padded seat for comfort, chrome hood, chrome windshield, chrome headlights, chrome grill ornaments, chrome steering wheel, chrome portholes and hubcaps. Built just like the Murray Comet cars were made in the 50's this car is sure to become a family heirloom. All metal - steel construction with solid Duralast rubber tyres.